Which of the following choices describes the end behavior of the function shown below? Find the range of y = log(x) + 3. Consider the graph of y = ln(x) with the limited domain (0, 10]. 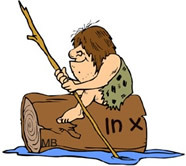 What is the maximum value of the function on this interval? Find the domain of f (x) = ln(x + 3). Given f (x) = e3ln(x). Find the value of f (2). is shown at the right. Which statement must be true about b? Which statement about the graph of f (x) = log9 x is false ? The domain is the set of positive reals. The equation of the asymptote is y = 0. The range is all real numbers. The graph has no y-intercept. x-intercepts of the functions f (x) and g(x) ? x-intercept of f (x) has larger x-value. x-intercept of g(x) has larger x-value. 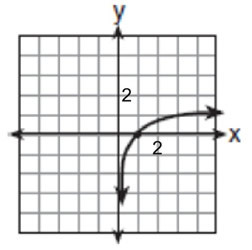 x-intercepts of the two functions have the same x-values. The graph of the inverse of y = 3x is shown at the right. Which of the choices represents this graph?